I don't know about y'all, but my December 1st turned out to be pretty darn good. With so many really good college football games to watch I barely had time to squeeze anything else into the day! Kansas State will play Oregon in the Fiesta Bowl - that should be a fun game to watch. Go Ducks! Wisconsin pummeled Nebraska for the right to play Stanford in the Rose Bowl. Sorry you Bruin fans. Go Trees! And, Alabama will meet Notre Dame for the national championship in a game that might end up 3-2 the way both teams play defense. Go Leprechauns! 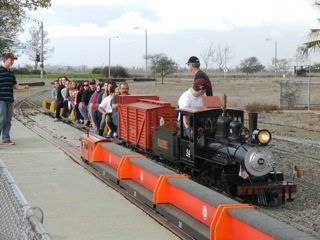 This morning, however, my sweet and very patient wife drove over to Fairview Park, to the site of the model trains, to join Chief Tom Gazsi and members of the Costa Mesa Police Department as they began their "family" Christmas celebration. It turns out that Chief Gazsi is a founding member of the group that has operated the model trains since 1989. Then they heard it. It sounded a little bit like hoof beats, but it turned out to be the flapping of the rotors on his "sleigh" - a magnificent helicopter. 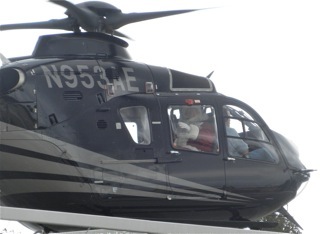 Yes, Santa was delivered to the party by helicopter, flown by officer (and former ABLE pilot) Rob Dimel. 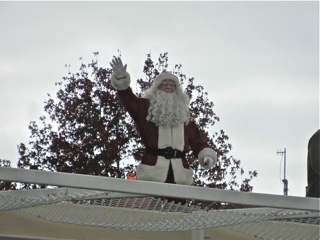 Santa made a slow pass over City Hall, then returned to land on the now defunct - but still very operational - helipad. 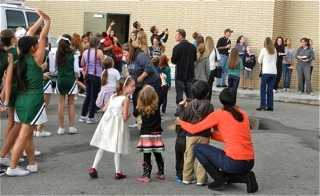 He clamored out of the helicopter, waived to the assembled group, then walked down and greeted many of the children. 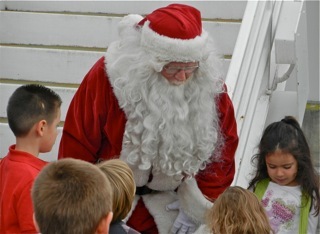 He also paused to have his photo taken with members of the Costa Mesa High School Cheer Squad, who were in attendance to help welcome Santa. 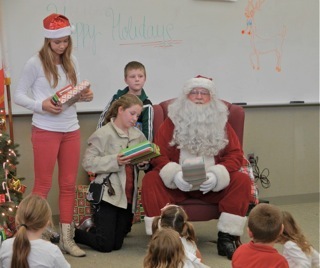 He then made his way into the EOC to hand out individual toys to the boys and girls. It was a very lovely, uplifting event and a great way to start the month. 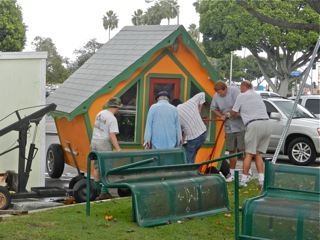 Speaking of uplifting events, on the way into the EOC I saw many of Snoopy's helpers working on the components of the Snoopy House display on the lawn in front of City Hall. 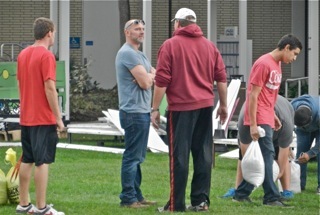 I saw uber-volunteer Terry Shaw with a group of men wrestling a large building into submission. I also saw Manager of Public Affairs Dan Joyce with recently-elected councilman Steve Mensinger working hard to help get the components into place. According to the published schedule, the Snoopy House will be open to the public from December 14th through December 25th from 5 to 9 p.m. each day. I'm sorry to have missed the Costa Mesa Firefighter's Burger Cook-off at Bloomingdale's this afternoon. So many events (and games), so little time. As I said, it was a good way to start the month and get into the holiday spirit. And remember, Santa's making a list and checking it twice because he knows who's been naughty and who's been nice... Uh-Oh! The agenda for the first City Council meeting of the new era has been published and has some very interesting items on it. This meeting will apparently have the closed session at the tail end of the regular meeting to allow new council member Sandra Genis to fully participate in the deliberations. I'm led to believe this is a one-time change. The meeting is scheduled to begin at 6:00 in council chambers at City Hall. You can read the entire agenda HERE. It will begin with Public Comments, Council Members Reports, Comments and Suggestions then will address the resolution validating the recent General Election. You can read that staff report HERE. The council members elected - Sandra Genis, Steve Mensinger and Gary Monahan - will be sworn in and seated. Somewhere along the line the new mayor and mayor pro tem will be elected and a break will be taken to juggle the chairs on the dais and have a short reception for the winners in the election. I don't expect the scheduled items on the agenda to begin until around 7:00, and then it will likely be the Public Hearing item, below. Following the report from Tom Hatch, City Chief Executive Officer, the council will consider the Consent Calendar - a long one this time around. There are seventeen (17) individual items on the agenda, several of which will likely be pulled for separate discussion. For example, Warrant #2449, HERE, might get pulled for a discussion of the charge from Jones Day - the expensive law firm handling the OCEA lawsuit - for over $69,000. So far they've been paid well over $1 million on that bogus lawsuit, and that doesn't include charges from our contract law firm, Jones and Mayer, for their part in the suit. Item #6, the deletion of the 19th Street Bridge, may generate some discussion. The staff recommendation is to receive and file - no action is required. The staff report is HERE. Item #8 is the proposed acceptance of a donated bus to be used for Senior transportation, HERE. Item #11 deals with the acquisition of $922,000 in funding to rehabilitate Red Hill Avenue, widely considered the arterial roadway in the worst condition within the city. The staff report is HERE. Item #13 deals with $1 million in grant funding to beautify Harbor Blvd. and enhance the streetscape on 17th Street. That staff report is HERE. Item #14 is for engineering services of $69,745 for work on Industrial Way and Storm Drain Improvements, HERE. Item #15 is an engineering contract for #160,387 for design of Fairview Park Multipurpose Trails, HERE. Item #16 is design services for Brentwood Park in the amount of $95,605, HERE. Item #17, the final item on the Consent Calendar, is a request for the authorization of a new position, Deputy City Clerk, HERE, to formalize the position that Christine Cordon had been doing before her recent promotion to a position in Public Affairs. The council will then change dresses and become the Successor Agency to the Redevelopment Agency and consider one item, the independent accounts report, HERE. Next on the agenda is one Public Hearing, which I suspect might be moved to the head of the line since council policy calls for public hearings to begin at 7:00 or as close to that hour as is possible. This item, if approved, will require the owner of Anchor Trailer Port Mobilehome Park to implement a "Closure Impact Report". You can read most of the staff report HERE, but several pages are missing. Hopefully, that will be remedied on Monday so we can actually read and understand the report. There is no Old Business scheduled, but there are a couple VERY interesting items under New Business. The first is a discussion of rescheduling or canceling the City Council meeting that would normally fall on Tuesday, January1, 2013. Options presented are to move it to January 8th or cancel it altogether. retiree medical liabilities at the mid year budget review in February 2013. 5. Reject all bids for the remaining outsourcing services where the City Council has yet to provide direction. Personally, I'm going to be VERY interested to see how the discussion of this particular item goes. It will come at the end of the meeting and we all know that most councils don't do their best work late in the evening. At that point we will hear a report from the City Attorney, then the council will adjourn to Closed Session to consider two items involving anticipated or present litigation. Well, the votes have been counted, and counted, and counted, Registrar of Voters Neal Kelley has certified the election and that fat chick has finally sung. 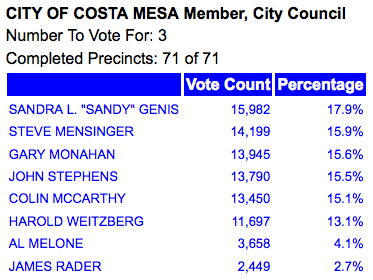 All that is left is for the Costa Mesa City Council to pass a resolution accepting the vote count in the city council race before the chairs are shuffled next Tuesday evening and Sandy Genis replaces the lamest of lame duck council members, Eric Bever. Despite missing some prime campaigning time due near the end of the race to a personal family tragedy, Bob Rush still managed to convince 43.4% of the voters in this race that he was the better choice than the candidate anointed by the OC GOP. This result should make Scott Baugh and his pals more than a little nervous. 155 votes separated Gary Monahan and John Stephens and a completely different mindset by a majority on the council. We'll see if the "kinder, gentler" Jim Righeimer uses the power of the majority with an even hand or if he continues down the path he's followed for the past two years. We'll never know the actual impact the presence of Al Melone and James Rader had on the results, but it's pretty darn frustrating when you realize that Rader wanted off the ballot as soon as he filed. How his 2,449 votes would have been distributed is fodder for much speculation. My biggest smiles are reserved for this particular result. 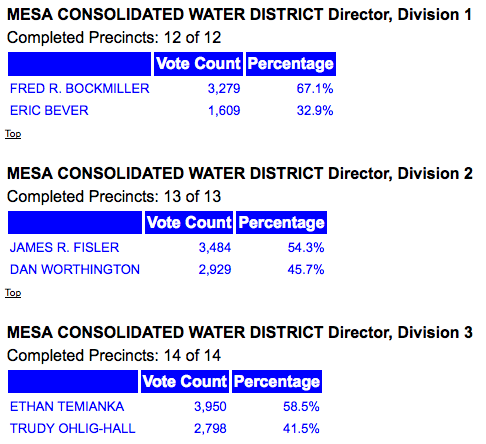 Having Jim Righeimer's Charter go down to such a resounding defeat tells me that sometimes the voters do actually listen. Of course, he is now attempting to spin this crushing defeat to mean that people DO want a charter, just not that one. We'll see how that plays out over the next few weeks, likely beginning with the council meeting on December 4th. We learned from this race that the attempt by the OC GOP to take over every elected body in Costa Mesa has failed, big time. 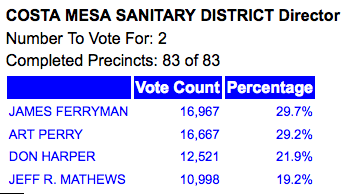 The win by Jim Ferryman and Art Perry over OC GOP darlings Don Harper and Jeff Mathews is good news for the rate-payers of the Costa Mesa Sanitary District. I have mixed feelings about these races. I'm OK that Jim Fisler defeated Dan Worthington. I'm giddy that Fred Bockmiller ground Eric Bever into the turf. 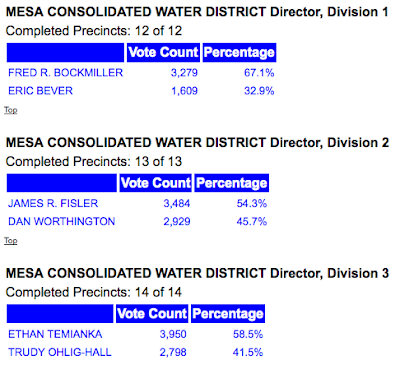 I'm disappointed that Righeimer protege' Ethan Temianka outspent Trudy Ohlig-Hall to oust her from the seat she's held for decades. I wonder just how focused young Ethan will be on this job since he's apparently expanding his business operations to Arizona. This result is good news for the folks at Coast Community College District and those it serves. This was a curious race, with the City of Newport Beach asking the voters to pass a large bucket of changes to its charter - 38 in all - all at one time. So, folks, it's over for a couple years. Time to put our noses to the old grindstone and get on with the business of the city. The Primary Election for the 2014 cycle is eighteen months away. It seems likely that Jim Righeimer will try to jam another version of a charter down our throats on that ballot again. I hope the folks that might be involved in a new charter effort will push back on that, and design a timetable to get the charter - I'm STILL not convinced we need one - onto the General Election ballot two years from now. 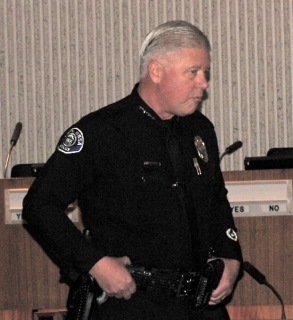 In the early evening last July 8th, dispatchers at the Costa Mesa Police Department received a telephone call from a frightened young boy who told them that his mother's boyfriend was in their house on Redwood Avenue with a gun. 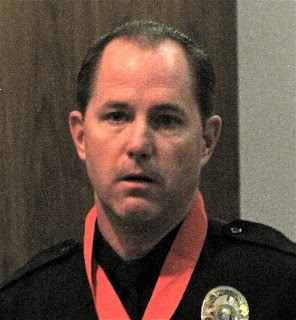 That set into play a series of actions by the dispatchers and several members of the Costa Mesa Police Department that resulted in the arrest of Thomas Wilhelm for the murder of his former girlfriend and business partner, Christine Murray. The trial for that murder is underway right now. In an event attended by approximately 50 members of the staff and community, today an emotional and proud Police Chief Tom Gazsi and his senior staff honored fourteen members of the police force and staff in City Council chambers for their outstanding performance and professionalism in that crisis. 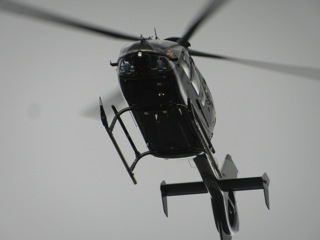 You can read Lauren Williams Daily Pilot report on the event HERE. 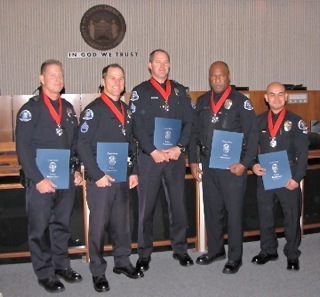 The five officers who received the Medal of Merit - second only to the Medal of Valor - for their courageous breaching of the house after hearing gunfire and not really knowing what to expect. They located and arrested Wilhelm, who had apparently emptied his handgun into the body of Murray. Those officers shown below are: Officer Jon Dozie; Sergeant Bryan Wadkins; Sergeant Matthew Grimmond; Officer Frank Christian and Officer Kha Bao. 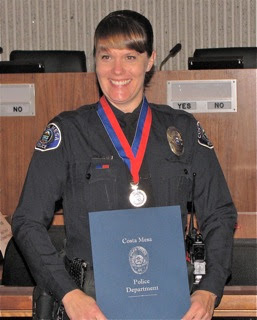 Officer Nichole Brown received a Distinguished Service Award for her actions rendering aid and consoling Murray as her fellow officers apprehended Wilhelm. 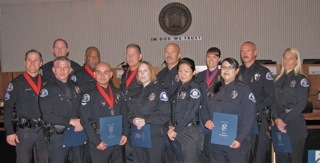 Class "A" Commendations were awarded to Officer Michael Cohen; Officer Lance Healey; Officer Hans Guenther; Communications Supervisor Janet Wingert; Communications Supervisor Reena Bolle; Communications Officer Joanna Lopez and Communications Officer Rachel Caruso. 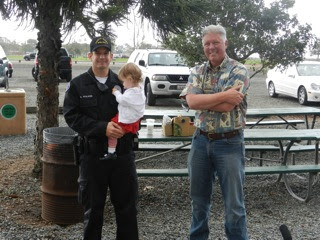 Officer Charles Oliver was not present for the ceremony. Sergeant Matt Grimmond spoke briefly during the ceremony, indicating that the event on July 8th is what they were hired to do. He mentioned that, while many of his peers live in Costa Mesa, others do not, but still feel it is "their city" since they spend so much of their lives in it, protecting it during just this kind of crisis. We know that Wendy Leece had to work today, but no other members of the City Council attended the event. 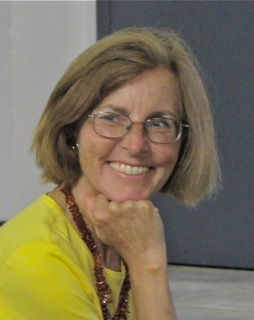 Councilmember-elect Sandra Genis was in the audience. As a resident of this city for more than 39 years, I am VERY proud of all these fine members of the Costa Mesa Police Department and happy they are on the streets, protecting and serving us every hour of every day. Thanks to all these outstanding professionals for their efforts on our behalf. In case you missed it, Christopher Trela has been named editor of the Newport Beach Independent, replacing Roger Bloom, who moved to the Orange County Register this week as editor of several local editions, including The Current, that serves Costa Mesa and Newport Beach. You can read the announcement of Trela's appointment in the "Indy" HERE, and you can read a little more about Trela HERE. SUPREME COURT SAYS NO! TWICE! 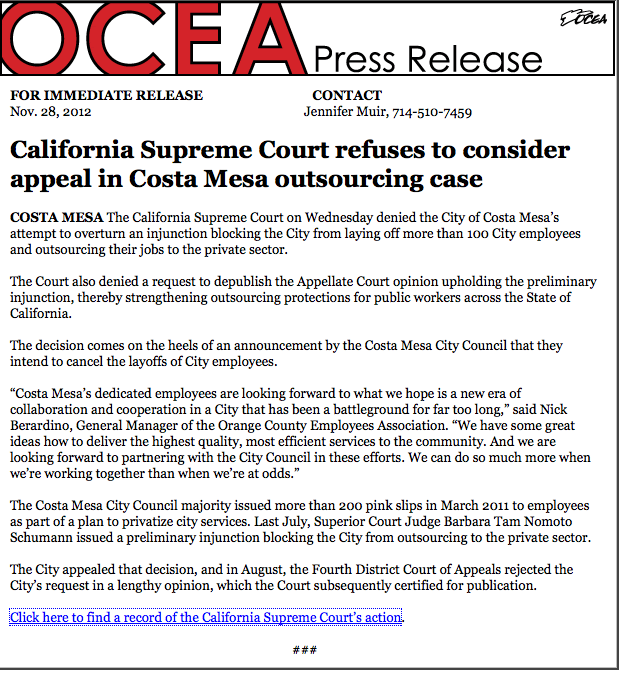 In a press release this afternoon the Orange County Employees Association (OCEA) announced that the California Supreme Court today "denied the City of Costa Mesa's attempt to overturn the injunction blocking the City from laying off more than 100 City employees and outsourcing their jobs to the private sector." The Court also denied the request to depublish the Appellate Court opinion upholding the preliminary injunction, which apparently means that many California cities now find themselves on the horns of a dilemma. As we understand previous information on this issue, this may mean that many California cities are now in violation of the law regarding outsourcing city operations. Both the League of California Cities and the Association of California Cities Orange County had joined the petition to the Supreme Court on the depublishing issue. Calls to city officials had gone unanswered by the time I decided to publish this information. As I get more information I'll update this entry. Check back later. The City of Costa Mesa is looking for volunteers to help with the preparations and planning for the 60th Anniversary Celebration. In a press release issued today (below) they announced the need for folks to serve in a variety of ways. So, fill out the "Committee Interest Form" as described below and get cracking! The Costa Mesa City Council is seeking volunteers to serve on the City’s 60th Anniversary Celebration Planning Committee. 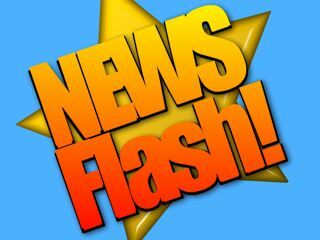 The committee, which will be comprised of residents and members of community organizations, will work to plan, promote, and facilitate activities related to the 60th Anniversary Celebration starting in June 2013. There are five general public seats available, and each Council Member will select one individual to serve on the committee. Appointed members should be available to attend the committee’s first meeting scheduled for Tuesday, Dec. 11 at 5:30 p.m. in the Emergency Operations Center (EOC) in the Police Department’s headquarters at 99 Fair Drive. Individuals interested in serving on the committee may electronically submit a completed “Committee Interest Form” via the City’s website. A form may also be downloaded from the City’s website, and mailed or hand-delivered to: City CEO’s Office, 77 Fair Drive, Costa Mesa, CA 92626. Applications must be received by 5 p.m., Friday, Dec. 7. For further information, please contact Dan Joyce, public affairs manager, at (714) 754-5667 or dan.joyce@costamesaca.gov. In anticipation of the first council meeting of the "new era" - the kinder, gentler, more conciliatory era - next Tuesday I thought I'd present some food for thought. It is widely assumed that we will see Mayor Pro Tem Jim Righeimer elevated to the big chair and become Mayor on December 4th. Logic also tells us that his pal, Steve Mensinger, will be elected Mayor Pro Tem. These moves will likely result in Wendy Leece and returning councilwoman Sandra Genis being relegated to the outside seats on the dais - they will be on the outside looking in, both literally and figuratively. I heard Righeimer's words of conciliation at the last council meeting and, despite my serious apprehensions, I'm willing to give him the benefit of the doubt. I'm willing to give him a chance to demonstrate the "New Righeimer". I'm willing to join Orange County Employee Association General Manager Nick Berardino - who showed up at the last council meeting with harmonious words of his own - in taking Righeimer at his word. Righeimer tells us he wants to retract all remaining layoff notices - he said there are 70 still outstanding - and work with the employee associations toward the goal of saving money by outsourcing WITHOUT resorting to layoffs. He specifically mentioned the Costa Mesa Police Officers Association because negotiations have apparently stalled. It's going to be VERY interesting to see just how willing that particular group will be to sit down with him. There has been distrust and animosity between Righeimer and the police association for years, so we'll be interested to see what effect the truce flag has on that relationship. 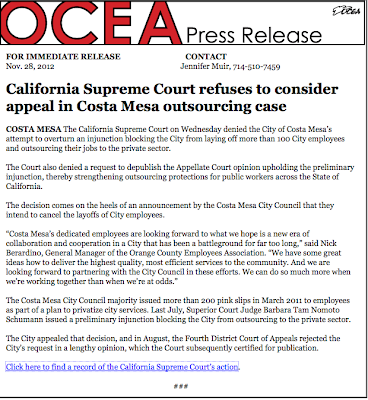 Righeimer also seems determined to force a charter on Costa Mesa. Early last November I wrote about it when he first surprised us with his idea HERE on this blog and HERE in the Daily Pilot. A month later, following his presentation of HIS charter at a council meeting, I wrote about that event HERE. Now he has asked CEO Tom Hatch to come back with a process by which that ball could be kick-started again. Personally, I think he's jumping the gun - again. With the resounding defeat of HIS charter on November 6th the message should be loud and clear - the voters of Costa Mesa don't want a charter. He has yet to give us specifics on just why he thinks the City should "join the big boys" and become a charter city. He says we have eighteen months to put a new charter initiative together. Actually, we have two full years before the next General Election. The question of a charter should NOT be placed on a Primary Election ballot - it's too important to the future of the city to have only a small percentage of the voters - typical in an off-year primary - make the decision. So, there's no reason to rush the process. If we do it, we need to get it right. Assuming for a moment that a committee or commission is created to craft a proper charter for Costa Mesa, it should include representatives of all constituencies - residents, business owners, major community organizations including neighborhood homeowner associations, service organizations like the Chamber of Commerce, Lions Club, Kiwanis Club, etc. It should NOT be stacked with political cronies the way they've stacked the Investment Oversight Committee, for example. Righeimer has demonstrated during his short time in Costa Mesa that he is NOT a patient fellow. 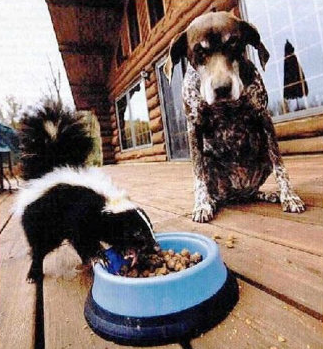 Leading a municipal government requires, no, DEMANDS, patience. He and Mensinger fancy themselves men of action, so patience is not in their normal lexicon. They have to change and work within the process that's established to protect all the residents of this city. Perhaps Sandra Genis' presence on the dais will help with that... we'll see. So, off we go on this new honeymoon with Jim Righeimer. It is with great anticipation and apprehension that I wait to see how he performs. We'll see if he continues to suffer with a premature problem - trying to hurry things to a climax without the inconvenience of a little foreplay. I suspect it won't take long to find out. To refresh your memory, here's a short video clip from the last council meeting in which Righeimer tries to set the tone for the future.